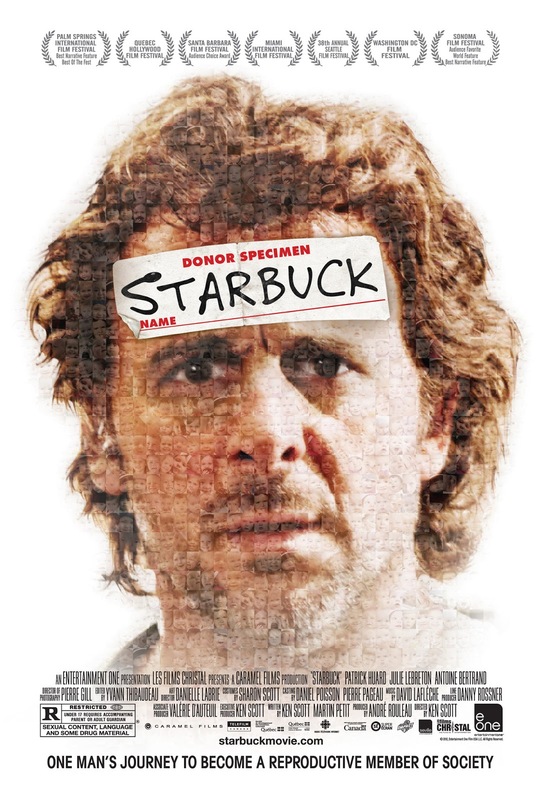 Starbuck tells the story of David Wozniak, a middle aged everyman and genial slacker. Adrift in a life comprised of a job delivering meat for the family butchery, playing soccer matches with his club and getting hounded by menacing debt collecting leg-breakers, David finds himself as the central player in a scandal concerning a local sperm bank. Allegedly, through some type of error in record keeping, David’s sperm had accidentally been distributed to a large population, giving rise to 533 offspring. Of the 533 children, 124 of them are demanding that the sperm bank deliver the name of the anonymous donor, known only as Starbuck. A class action suit is filed against him by his progeny. With the hope of procuring the money he owes to some bad people, David, with the help of friend / lawyer Avocat, files a counter suit defending his right to anonymity. In the process of building his case, David is given the profiles of the 124 people who want to know his identity. He searches them out, trying to find out who these children he had fathered twenty years prior have turned into. As he meets his children, he begins to feel compassion for them and starts helping them out where he can, all while not telling them his true identity as their father. Told with warmth and humor, Starbuck is a movie that is aimed directly at the heartstrings of its audience. Fair performances are delivered by most of the cast, most notably by Patrick Huard in the role of David. His portrayal of the hapless protagonist is very honest and endearing, making the swallowing of this far fetched premise by the audience that much more palatable. Yet for all of this, the movie fails to deliver the emotional impact that it attempts, its main fault being the immense holes in the logic of the film. For example, in order for the film to work, the distance between the definitions of “donor” and “father” have to be overlooked, something that, in an ever increasing age of disconnect, is a difficult thing to do. A movie like this is meant to have the feel of being taken from the headlines of today and, given that, the details have to connect with the audience in order for the movie to be convincing. Unfortunately for Starbuck, the details just don’t add up. Starbuck does succeed in telling a non-traditional family drama, if the family you’re talking about happens to involve 533 kids. The main themes of connection and relationships with ourselves through our familial extensions are very clear and applicable. The heart is definitely in the right place, but, overall, misses the beat to making a memorable movie. Starbuck opens today in Philly-area theaters.